We (the Earth) supposedly just passed through the Galactic center, which is kind of amazing, since that only happens every 32 to 35 to 39 million years or so. 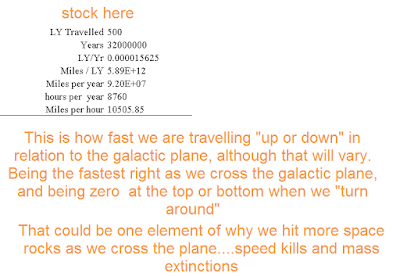 I wanted to get some perspective on what this means, how likely it is to "be true", and ramifications for extinction level events (big nasty space rocks). What are the chances of that happening during the same century that we went from the iron age to the "nuclear age". What are the chances of that happening as our spaceship does a fly-by of Pluto? So a review seems to show that our little solar system bounces back and forth across the Galactic plane, which seems to be a conventional gravity effect. As schoolchildren, we learn that the earth is moving about our sun in a very nearly circular orbit. It covers this route at a speed of nearly 30 kilometers per second, or 67,000 miles per hour. In addition, our solar system--Earth and all--whirls around the center of our galaxy at some 220 kilometers per second, or 490,000 miles per hour. As we consider increasingly large size scales, the speeds involved become absolutely huge! 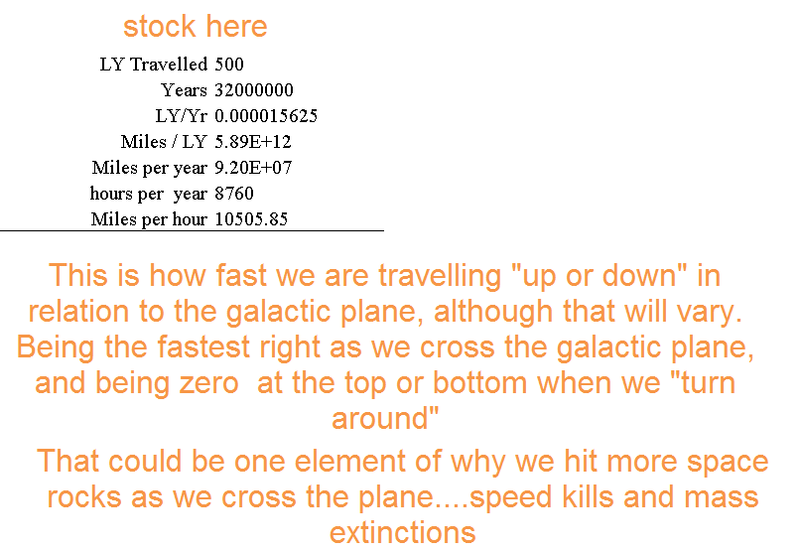 So let's just guess that our vertical speed as we pass through the "plane" is 20,000 MPH that adds quite a bit to our speed of 67,000 MPH while going around the Sun, but that wouldn't seem to explain a 10 fold factor of hitting more large objects during the plane crossing. Historical records of large meteorite impacts show that there are clusters of impacts that match when the Earth (think solar system) pass through the galactic plane. I mean, it kind of makes sense....there is just a lot more stuff gravitationally drawn into the galactic plane. And there is some pretty good science behind it. 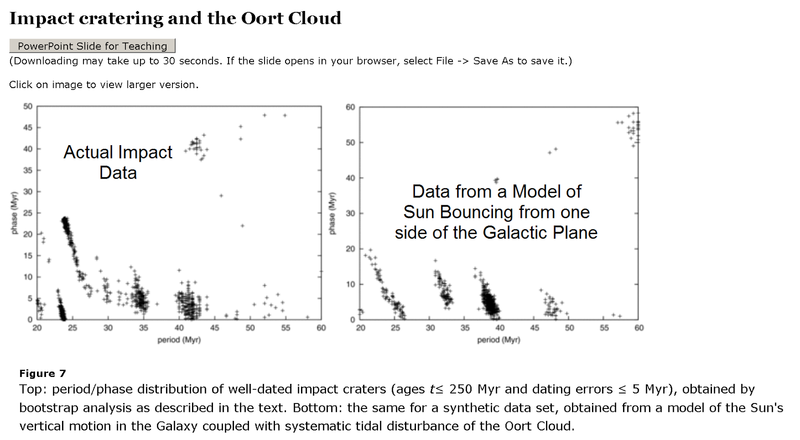 Plus that name the "Oort Cloud" just sounds scary, LOL. Here is the link to the science. Obviously they get into some very unique mathematical methods. 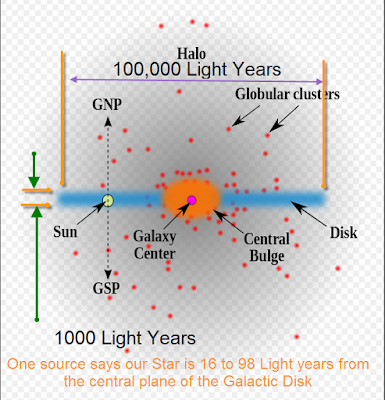 In the following visualization, globular star clusters are red and open star clusters are green. The Sun is buried near the center of the open star clusters. None of these points are to scale, they are only used as location markers. We cannot see as far within the plane of the galaxy due to obscuring dust and gas, so this generates an observation bias making it seem like open star clusters are only found nearby. In fact, it’s only the nearby ones that are easy to see. Globular star clusters, because they are often found well above the plane our galaxy, can often be seen much farther away, since less dust and gas obscure our view. I got the video from the Wolfram blog, is this the same as the Wolfram Alpha calculator, which is so useful? hmmmm, then the asteroids came and cooled things down? Mystery - The Earth Does Not Orbit The Sun In Only 2 Dimensions - It Travels Through Border Free Space At Speed Of 3.9 Million Miles/Yr. Nice article, I think we should get the flat earthers and the hormesis proponents together for a circle kumbaya. Funny corelation with the dinosaur extinction, don't you think? Best guess of the date of the impact that caused this extinction event is 66,000,000 years ago. As close as you can get to the date of the crossing of the galactic plane two passes ago! Would seem to validate your concerns, stock. 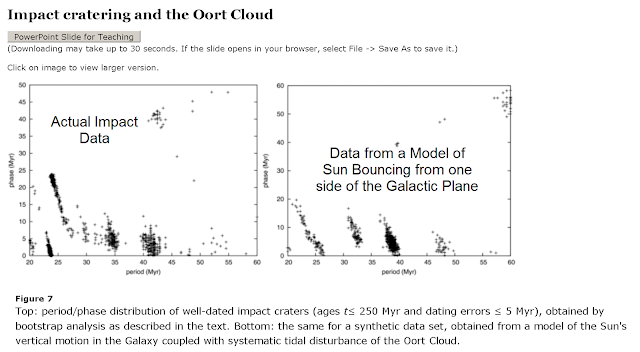 Regular disturbances in the oort cloud could send rocks tumbling into the inner solar system. Increased dust loading in the upper atmosphere is slowing the earth's orbit causing the earth to heat up. Foolish surface dwellers won't know what hit them. Ya, and we got scientists deliberately draining a Van Allen belt as if we don't need to create our own problems. sheesh. Note that at the apex of the cycle, the vertical velocity may slow to zero, yet the rate of vertical (de)accelleration changes as well. 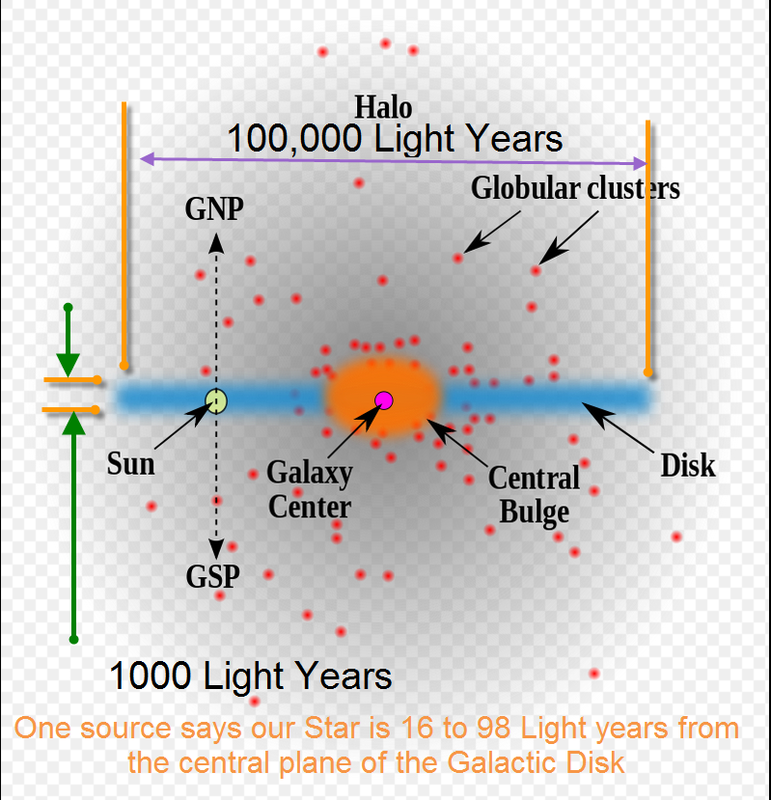 "Quote: "In my research, I came across the idea that when the Sun is at the apex of its bobbing, towards galactic north, it’s about 100 light years above the galactic plane. That’s far enough up that the magnetic fields of the galaxy are weaker, and it’s these fields that protect the Sun (and the planets, meaning us) from intergalactic cosmic rays, subatomic particles that zip around space between galaxies. When the Sun is up high, these cosmic rays can strike us, and we have to endure this particulate rain for millions of years. The radiation can do bad things, like damage the ozone layer or induce genetic mutations." "A new result has just been announced that says that when the Sun is in the thick of the Milky Way’s plane, tides from the galaxy can induce comets from the outer solar system to plunge down toward the Sun, meaning many will hit the Earth and potentially cause mass extinctions." "According to the new study, this happens every 35 – 40 million years,"
If that be true, then those induced comets events should precede and follow that 64 million year period by about 16 million years. In addition, i don't understand why there is no affect noted (AFAIK) when the Sol system approaches it's most southern galactic apex." 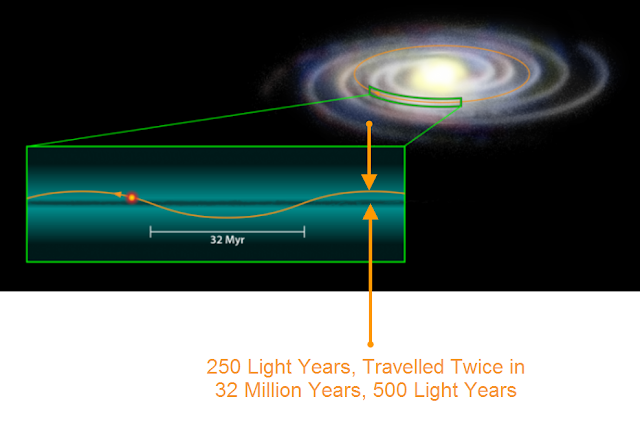 Wondering if "evolution" might acutely occur in ~64 million year intervals. "Quote from original article: "The Cardiff team found that we pass through the galactic plane every 35 to 40 million years, increasing the chances of a comet collision tenfold. Evidence from craters on Earth also suggests we suffer more collisions approximately 36 million years. Professor William Napier, of the Cardiff Centre for Astrobiology, said: "It's a beautiful match between what we see on the ground and what is expected from the galactic record." The periods of comet bombardment also coincide with mass extinctions, such as that of the dinosaurs 65 million years ago. Our present position in the galaxy suggests we are now very close to another such period." Quote: ""From the crater record there is no evidence for Nemesis. What remains is the intriguing question of whether or not impacts have become ever more frequent over the past 250 million years," he concludes." Quote: "The first measurements by the Rosetta mission's ROSINA instrument show that the deuterium-to-hydrogen (D/H) ratio of the comet 67P/Churyumov-Gerasimenko is highly enriched in deuterium. These results contradict the theory that the water present in the Earth's atmosphere and oceans has a cometary origin. They also indicate that 67P comets do not all come from one region, the Kuiper Belt: some may have originated in the Oort Cloud." Quote: "Based on the strong signal of magnesium and iron measurements seen by MAVEN’s Imaging Ultraviolet Spectrograph, Schneider says the hourly meteor rate overhead on Mars must have been tens of thousands of “shooting stars” per hour for hours. “I’m not sure anyone alive has ever seen that,” said Schneider, “and the closest thing in human history might the the 1833 Leonid shower.”"
Title: "Hiding in plain sight: Elusive dark matter may be detected with GPS satellites"
So, "Dark" Matter might accumulate more readily near the Galactic Equator? 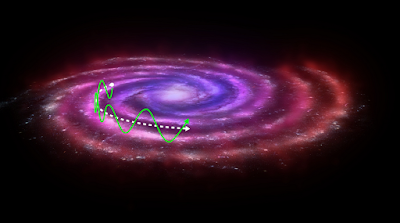 "Quote: "New research concludes that Earth's infrequent but predictable path around and through our Galaxy's disc may have a direct and significant effect on geological and biological phenomena occurring on Earth. Scientists conclude that movement through dark matter may perturb the orbits of comets and lead to additional heating in the Earth's core, both of which could be connected with mass extinction events." One wonders if the "Dark" matter distribution might coincide with periods mentioned above ("Dark" insofaras science doesn't know exactly - like as in the "Dark" ages)." Wouldn't it be easier to push it sideways, more bang for the buck.